You can choose your own map area to be transformed into a solid maple Wall Map. Using the map below, you can choose any place in Great Britain. The map area gives a preview of how your Wall Map will look. Once your map area looks correct, click Add to Cart. We will prepare and carve your Wall Map for this exact area. 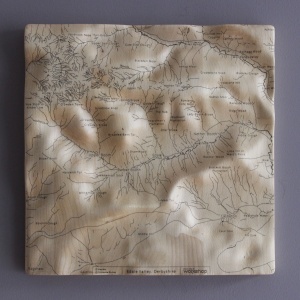 Our Wall Maps are carved from solid maple and engraved with a sharp, clean map design. They are 30cm square and can be easily hung on the wall. More mountainous areas will give a fascinating shape to explore, whilst detailed mapping will represent towns and cities. Essentially, what you see is what you get. Choose a title for your Wall Map. It takes up to 10 days for us to produce your Wall Map. Once you receive it, you will be able to hang it easily using the provided screw and wall plug. Or you can hang it onto an existing hook or nail, just like a normal picture frame. Please Note: If you are having problems viewing or choosing the map area above, try viewing this page on a different device – perhaps a computer rather than a phone or tablet. If you’re still having problems, please get in touch.